So bittersweet to say goodbye to these characters. But I am very glad to see that everyone is right where they should be. Choices were made and the consequences were paid, but in the end, all is well. Joan Comyn swore allegiance to Robert the Bruce the day she witnessed England’s barbarous king torturing her famous mother, Scot patriot Bella MacDuff. Now the mysterious beauty slips into men’s hearts like a specter and entices England’s most illustrious barons to unwittingly divulge their secrets, then shares them with her king. Known only as the Ghost even among her Highland Guard brethren, Joan has become the most wanted spy in England. The man determined to uncover her identity poses her biggest threat yet. Alex Seton once stood with Bruce but now fights for the enemy. Though Joan knows she must avoid the handsome warrior or risk discovery, his knightly chivalry touches a place in her long since buried. 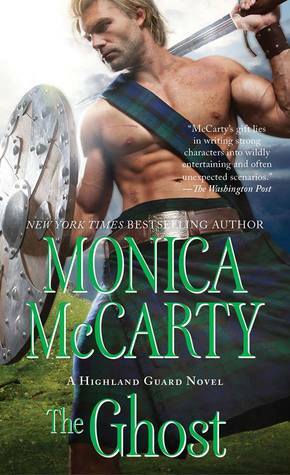 When his suspicions grow apparent, Joan realizes she must do everything in her power to stop Alex from revealing her mission and convince the powerful fighter to join forces with the Highland Guard once more. But as the ultimate battle in the great war approaches, will Alex chose love or honor? I am so happy we got to see how Joan turned out. We first meet her in The Viper and it was a little heartbreaking to see her turn her back on her mother and stay on the opposite side. But now we know that she did it for the right reasons. I love Alex. He is the very model of a noble knight. He is trying to discover who the spy is, but when all the pieces start pointing to Joan, he must decide what to do with this information. Lie and protect her, or tell the truth and lose her. When he left the guard, a few books ago, I so hoping that he would come back or just redeem himself. So bittersweet to say goodbye to these characters. But I am very glad to see that everyone is right where they should be. Choices were made and the consequences were paid, but in the end, all is well. These characters were so fun to watch and see them grow as individuals and fight with and for each other. I have completely enjoyed this historical romance series. I wish it could go on forever. Start the series from the beginning and fall in love, just like I did.